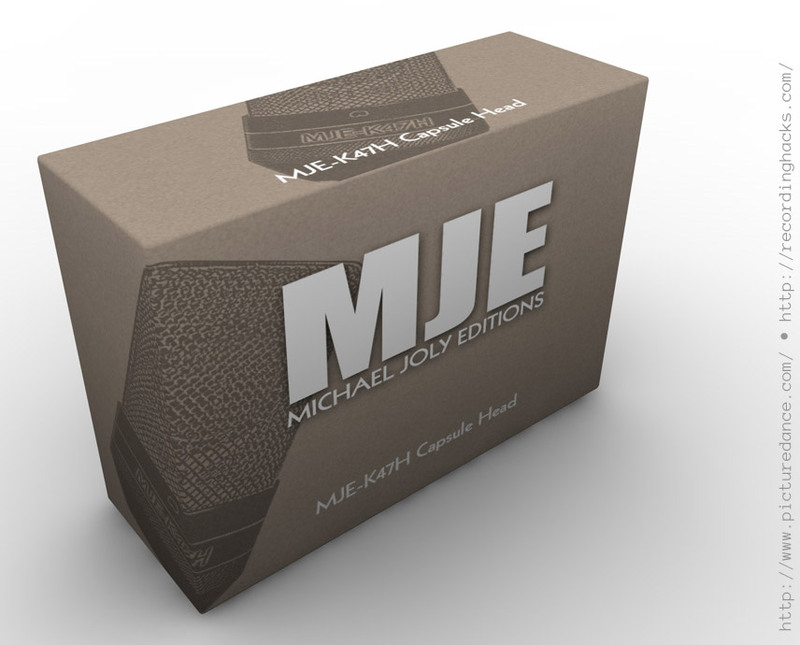 We’ve been aware for a while that Michael Joly has developed an exciting new product for the MXL 603S/604 and similar “pencil condensers.” Michael has been a friend to this site since its early days, and has given us an exclusive peek at the new gear and packaging. The new product is called the MJE-K47H. 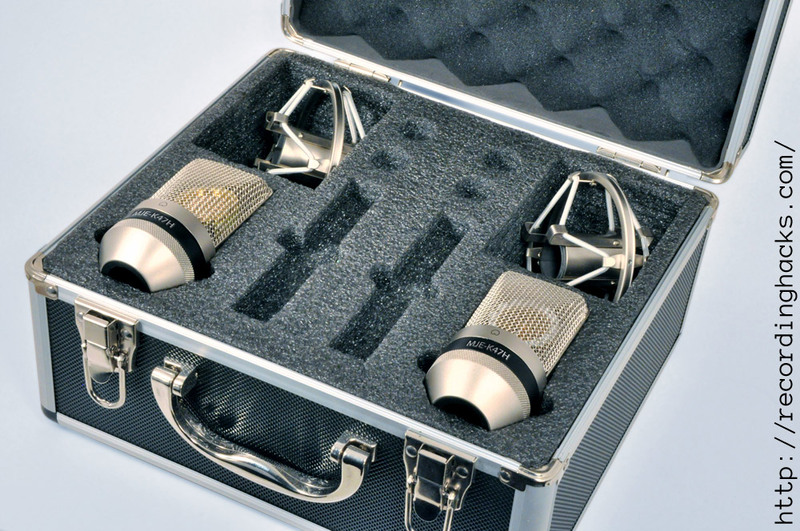 It is a large-diaphragm capsule modeled after the Neumann K-47, the famous single-backplate design used in what is arguably the world’s most lusted-for microphone, the Neumann U-47. 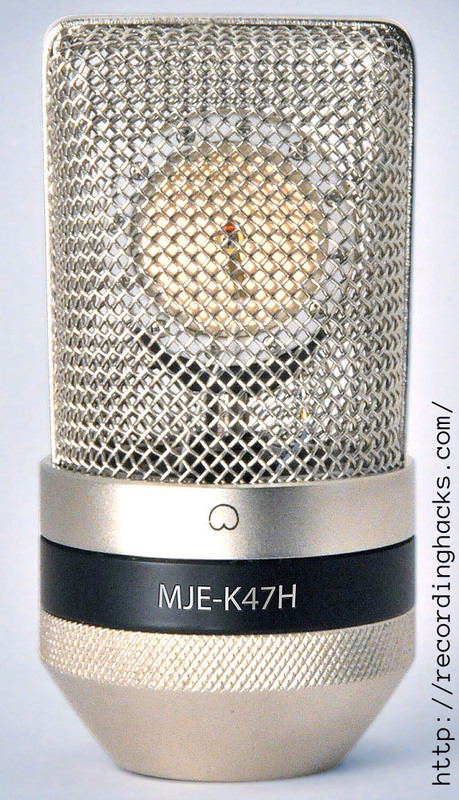 The headbasket on the MJE-K47H includes Joly’s signature single-layer grille — part of his suite of mods for numerous microphones — shaped to reduce parallel surfaces within the chamber. The combination reduces high-frequency coloration caused by standing waves and reflections in the vicinity of the capsule. 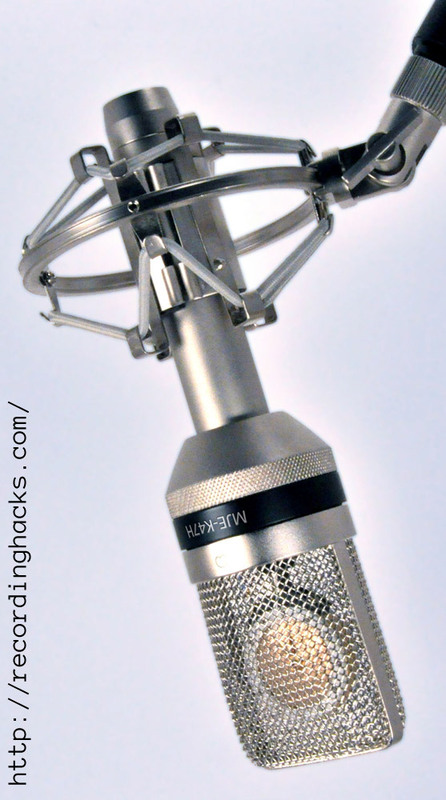 What led you to create a K47-based capsule for these inexpensive pencil mics? MJ: The large-diaphragm accessory head is a well established and successful concept in the Oktava line. Over the past several years recordists have been able to buy essentially the same 22mm SDC mic from a number of vendors like Nady, MXL, STC, Cascade, CAD etc. 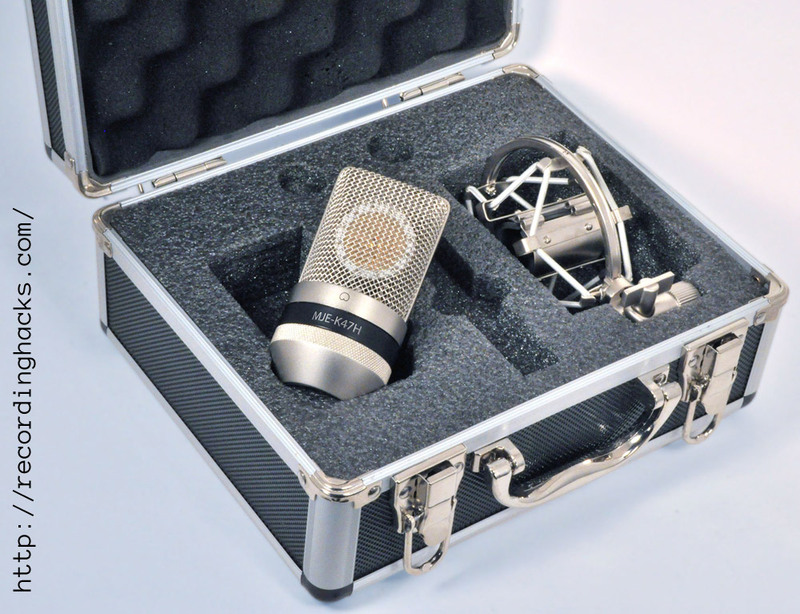 The microphone marketplace has responded very positively to my aftermarket modifications to low-cost mics that allow recordists to incrementally improve their mic lockers as their budgets permit. So I wanted to offer a large diaphragm “47-style” capsule head as an aftermarket accessory for folks who already own 22mm SDC mics. How does the new capsule sound? Can you compare it to the stock 603S capsule in terms of frequency response, transient response, and cardioid pattern width? The cardioid pattern is fairly wide — I’m really fond of this type of pattern because it means there’s less midrange phase shift at work and the on-axis midrange response is tighter as a result. Compared to the typical 22mm SDC capsule found on the 603S etc., the MJE-K47 is more midrange-focused, does not have the stock 22mm 8 kHz peak and offers the “bigness” we love to hear from a large diaphragm capsule used with vocals. Large-diaphragm capsules are usually lower in self-noise than are smaller capsules. Do you hear an improvement in self-noise as compared with a stock, imported small-diaphragm cardioid capsule (e.g. the 603S is rated at 18 dBA)? MJ: You know, I started my career working for David Blackmer, founder of dbx Inc. and Earthworks mics. Back in the dbx days I was totally focused on listening to reverb tails in noise reduction systems that faded down to 90 dB below program level. It was an obsession, and back then I fought for every dB of S/N I could get in my designs. But I finally took a chill pill and realized there are more important criteria than broadband noise floor measurements — the spectral distribution of that noise, for instance. But yes, the MJE-K47H capsule has greater output than a 22mm SDC and there are several dB worth of improvement in the signal-to-noise ratio. Do you position this as an all-around studio condenser, or are there particular instruments or voices for which it is particularly well-suited? MJ: My customers know I strive to deliver “workhorse” results: mics that can be used on a wide variety of sources and that can be stacked track after track. It is sort of an “old-school” signature sound like from back in the day when studios had only a small handful of go-to mics that got the job done, day in and day out. 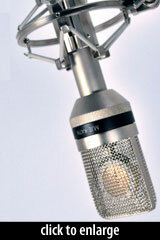 I’m really not interested in the concept of offering specially-voiced mics with narrow applications. As you mentioned, there is an obvious comparison here to the MK-012, for which large-diaphragm capsules are manufactured by Oktava, LOMO, and Blue (Red). Have you done any comparative listening between those and the MJE-K47H? MJ: I have. Probably the closest parallel is the high quality LOMO (branded) M1 and M3 heads for the MK-012 body. But while these heads use great capsules, the three-layer grille mesh in the heads introduces a fair amount of HF standing wave coloration. By way of contrast the MJE-K47H is a much more open-sounding single layer grille design. In addition, instead of parallel grille faces, the MJE-K47 capsule head grille has classic angled surfaces to further reduce standing wave generation. Have you done any comparisons with other K47-based FETs, like the TLM 49, Kel’s HM-7U, or the original 47fet? 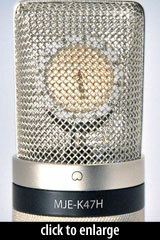 MJ: I have a group of microphones down at Clinton Recording Studio in NYC. Clinton is the last “big room” on the East Coast and has a mic locker to die for. A staff engineer has been using the MJE-K47H on a number of sessions and has been blown away. He’s writing a review for The Deli Magazine with accompanying sound samples. 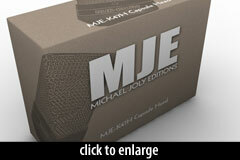 Michael tells us that the MJE-K47H will be available in mono or stereo sets. 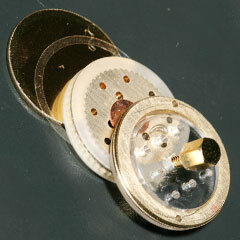 One or two of the capsule heads would be shipped in a padded flight case with elastic shockmount, with die-cuts for your small-diaphragm caps and the microphone body too. 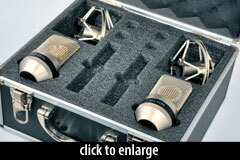 It turns your lonely SDC into a real hybrid mic kit. For lower-budget users, the MJE-K47H Solo makes the new capsule head available without any accessories. The packaging, designed by Michael’s brother, looks great — a definite step up from some of the microphone packages that have come into the studio. These are pre-release renderings and subject to change, but I have to say I like what I see! 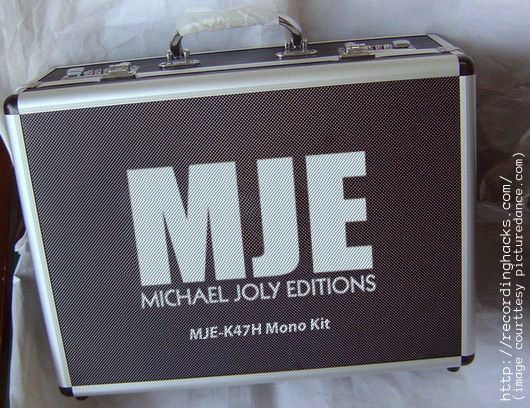 The flightcase for the Mono and Stereo kits is silkscreened with the new MJE logo. They’ve designed a nice cardboard case for the lower-priced Mono package too. Again, I’m not sure these will reach production, but it shows where Michael wants to take these products. These new capsule heads are currently compatible only with the Chinese-import SDC mics listed at the top of this article. Fans of the Oktava MK-012 need not feel left out; no fewer than four distinct large-diaphragm capsules are available from Oktava and LOMO, and if you shop around you might still find the Red R12 (manufactured by Blue). Michael Joly contributed a wonderful review of these capsules last year; see the Oktava MK-012 Capsule Review. Will the MJE-K47H be made available for the Oktava eventually? Cannot predict now, says my Magic 8-Ball, but if you want it, let Michael know. 100,000 MK-012 users can’t be wrong. 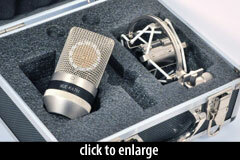 Hmm what about compatibility with the Rode N55 dual-capsule mics? Steve, the NT55 has a 20mm body. The new MJE head is designed to fit a 22mm body. Therefore it seems unlikely to fit. Ahhh didn’t realise the difference in size..